Today we’re announcing that the Electric Objects App has been acquired by GIPHY! This good news comes with a bittersweet milestone — after four years, we have decided to shut down the Electric Objects hardware business. While GIPHY will not sell or support new Electric Objects hardware, they are committed to maintaining the EO App for existing customers. For more details on the transition, visit our FAQ. 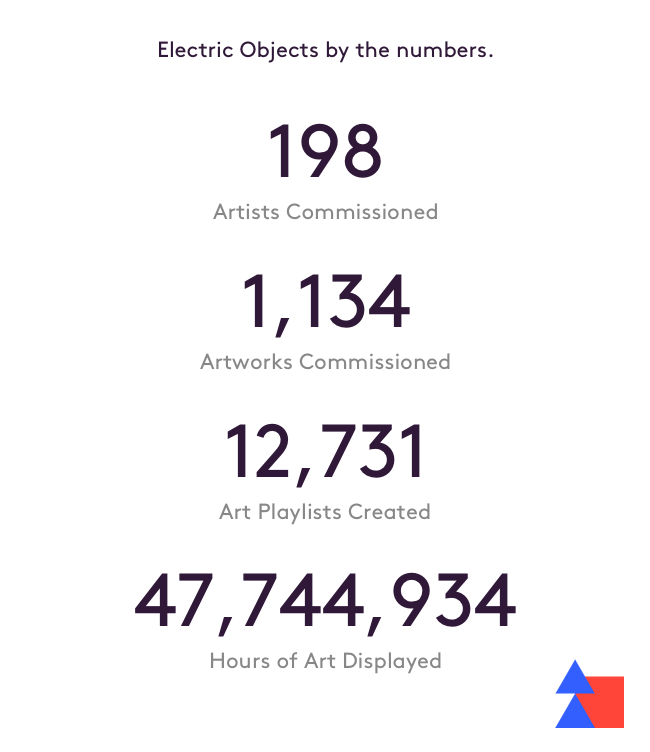 GIPHY’s commitment to the arts is unparalleled in the technology industry, and we couldn’t ask for a better home for the EO collection and our inspiring community of artists and art fans. GIPHY has been a partner to Electric Objects from the very beginning. Their Art Club collection, Giftopia, was among the first collections we launched, and among the most popular in the EO community. And behind the scenes GIPHY CEO Alex Chung has been a great source of advice and mentorship for me and the EO team. Many don’t know this story, but GIPHY was one of the original sources of inspiration for Electric Objects. I remember meeting Alex Chung, GIPHY’s CEO, in 2013, when I was still working at Digg at betaworks. Alex showed up one Monday morning having launched this new thing called GIPHY over the weekend, to a tremendous amount of early excitement (he seemed as surprised as anyone). Digg and GIPHY shared a room for a while, and as I browsed their early collection of featured artists, it occurred to me that this artwork would look fantastic on the bare walls of my new apartment, so I set about looking for a digital picture frame with support for GIFs. Turns out one didn’t exist, the rest is the story of Electric Objects, and it seems particularly fitting that the EO’s new home is also one of its original sources of inspiration. Electric Objects is a grand experiment — an exploration into a new kind of relationship with computing, an attempt to bring us closer to art and and artists, and a new business model for funding creative work. I’m proud of what this team has accomplished over the past few years, and happy to make EO a part of the GIPHY family. Finally, to our customers and artist partners — thank you for taking a chance on us, for believing in our version of the future, and for helping us bring this product into the world. Your data, your art, and the EO experience you know and love are in good hands. For more details on the transition, visit our FAQ.